Mattincincy: It's a shame that homeowner(s) near this cache are removing it from public property. I suppose they will be removing the steps next. Thanks to them for ruining a lot of peoples fun, along with a great history lesson. I hope your house doesn't slide down the hill. 1/10/11: PLEASE DO NOT PARK ON EMPRESS AVENUE TO ACCESS THIS CACHE. ALSO, DO NOT GO MORE THAN 5 FEET SOUTH OF THE STAIRWAY. I thought this would be a good spot to hide a cache, while learning a little bit about the area's history. 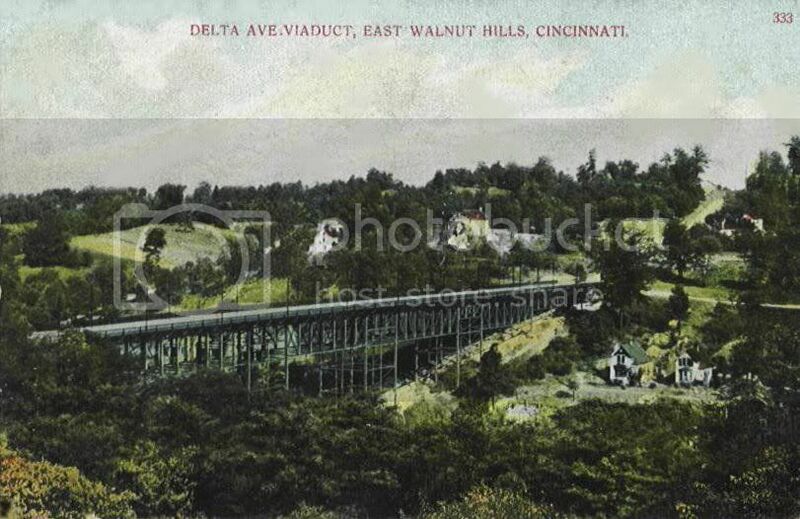 There used to be a very high viaduct connecting Grandin Road over Delta Avenue for many years. Unfortunately, it was removed in 1975 due to the cost to repair and many people thought it was dangerous. "Rather than spend money on more repairs and safety renovations, the city elected to raze the bridge in 1975. Controversy still exists today about this decision; some believe that Grandin Road residents unfairly used their wealth and power to coerce the City into razing the bridge, thereby guarding their privacy and protecting their property from other people (perhaps not so elite) Cincinnati residents who needed the viaduct." Whatever the reason, I thought this was an interesting piece of Cincinnati history and I hope others enjoy it as well. This cache can be approached from 2 different ways - either off of Delta Avenue or off of Grandin Road. Please hide as well or better so that this cache doesn't get muggled. Fbhgu fvqr bs fgrcf - svir srrg va.